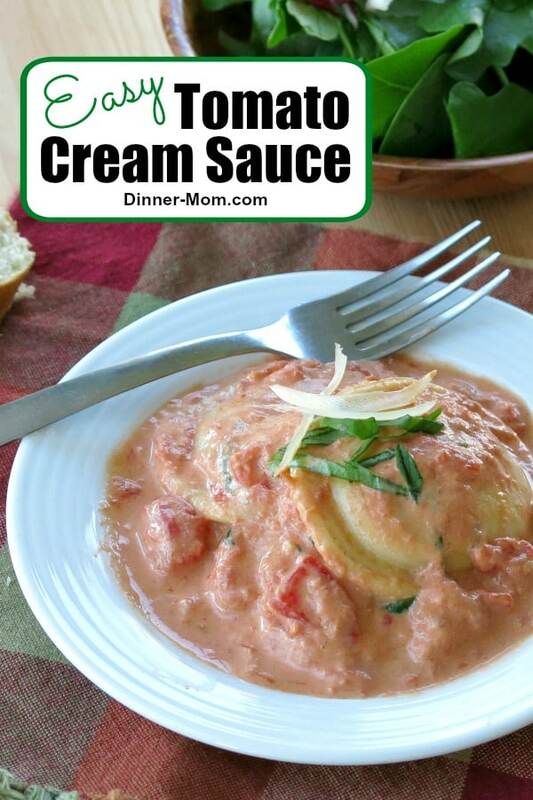 This decadent tomato cream sauce is perfect over ravioli or pasta. 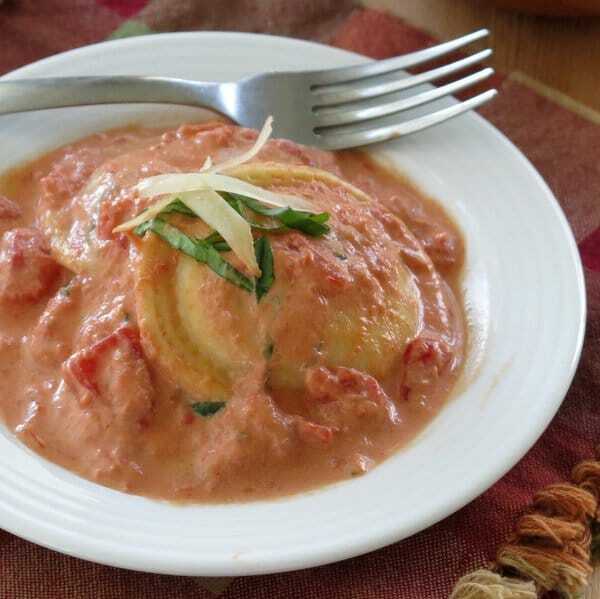 It has an intensified flavor from a little white wine and is seasoned with fresh basil and grated Parmesan cheese. If you’re celebrating with a romantic or fancy dinner, this is your recipe! This pink tomato cream sauce is a big ‘ole pot of love! Why? It’s often requested by loved ones on special occasions, like Valentine’s Day, New Year’s eve or a special birthday. It’s a recipe that quickly comes to mind when friends, or new parents, are in need of some pampering. Even though this dish screams extravagance, it’s actually really easy to prepare. Serve it over ravioli…and there’s a wide range of choices out there from lobster or wild mushroom to a three cheese variety. 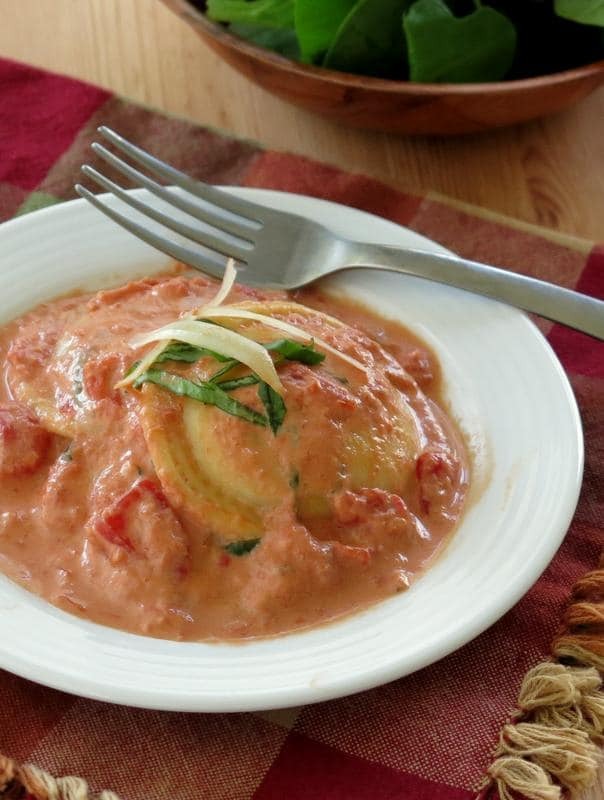 Toss the ravioli into the sauce during the last 5 or 6 minutes of cook time and it’s a one-dish meal that is ready in under 30 minutes. It’s also great with tortellini. Even better, stir in your favorite seafood, like lobster, shrimp or crab. Why add alcohol to Creamy Pasta Sauce? I am frequently asked whether the addition of alcohol to this recipe is necessary. And, it is absolutely not required. 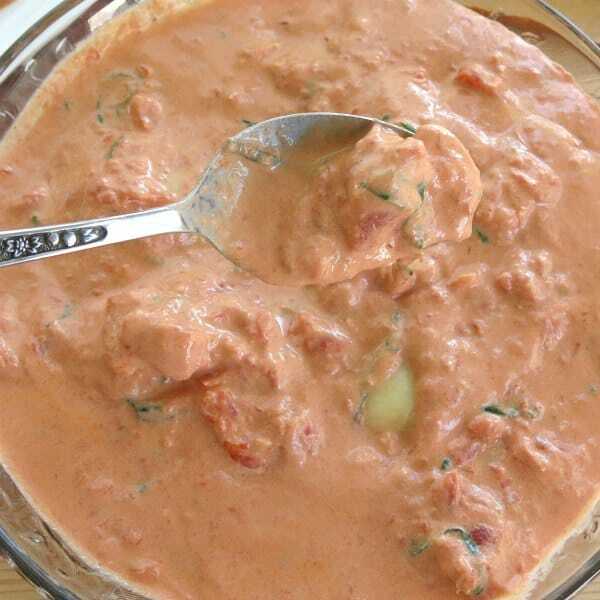 Tomatoes, garlic, cream…that combination is always going to taste good. However, I always add a little wine. (Yes, you could use vodka too.) The alcohol intensifies the tomato flavor. Much, but not all, of the alcohol cooks off. Read more about this debate in Ask the Food Lab over at Serious Eats. 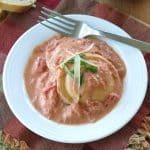 This easy tomato cream sauce tastes like it came from a fancy restaurant! Serve it over ravioli or pasta. Mix crushed tomatoes, diced tomatoes, garlic and wine together in a large pot. Bring mixture to a boil then reduce heat and simmer for about 7 minutes. Stir in cream, basil and simmer for about 5 minutes more. Garnish with basil and serve with freshly grated Parmesan cheese. Sauce may be frozen. For best results, use within two months of freezing. Hi Marjory. Really nice recipe. And I must give it a try soon. I have a package of ravioli in the fridge, that will get a good dousing of this sauce. I like adding wine to these types of dishes, but didn’t realize it intensified the tomato flavor … now I know why. Thanks for the recipe. Thanks Lea Ann. 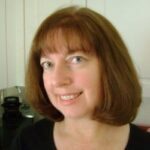 It took a little bit of research on my part to determine exactly why I liked it so much! You got my attention with “spiked”, my dad loved a sauce like this, his favorite!! Oh the power of words!